When the coolest kid in the class drops by David's house after school, David is worried about how popular, zany Ruben Plotnick will react upon meeting unpredictable Grandma Rosie. Will he make fun of her to his classmates? Will he imitate her whispery voice? What will he do if Grandma Rosie suddenly wants to dance? To his surprise, and relief, David learns that although Ruben may be a joker, he has an instant rapport with Grandma Rosie and accepts her odd behavior. In fact, when Grandma Rosie calls out, "Nate, let's waltz!" Ruben gallantly and proudly dances around the kitchen with her. This heartwarming story of senility and school-age embarrassment reveals the importance of looking beneath the surface to really get to know someone. 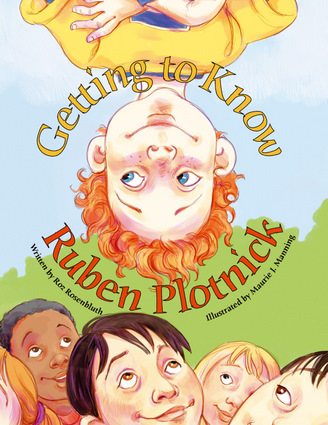 By accepting Grandma with all of her quirks, Ruben shows that he has a warm heart and can be a true friend. Roz Rosenbluth is the author of numerous children's books including Hungry Bear and Nettie's Spaghetti. Her fiction has appeared in Cricket and Highlights magazines, and she was the winner of the 2000 Highlights magazine humor contest. She has also held editorial positions at Bantam Books and the National Education Association. She lives in New Rochelle, New York. Maurie J. Manning is the illustrator of three books, including The Aunts Go Marching, a 2004 IRA Notable Book and Scholastic Pick of the Month. She lives in Berkeley, California.